So long, salt! 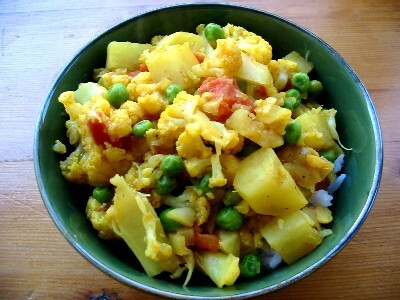 Incredibly healthy vegetarian fare, full of spice, rice and everything nice. Melt butter in a large saute pan over medium-high heat. Add onion, garlic and ginger and cook, stirring, 5 minutes. Reduce heat to medium. Add cauliflower, potatoes, tomatoes, water, wine and seasonings. Stir and then cover. Cook for 30 minutes, stirring occasionally. Remove cover, add peas, then cook for another 5 minutes, stirring occasionally. Remove from heat, spoon over cooked rice and serve immediately. Where can I find no-salt curry. I am a huge fan of curry but I ve not have much success in seeing them in stores. Any suggestions? Elena, try ordering online from either Penzey’s or Spice House.